This 1915 Kingsbury owned by Ken Kelly of Grand Rapids was built in the Charles River area of Massachusetts. McDaniel, a rugged looking man, paddled solo sporting a broad-brimmed hat. He appeared relaxed as he negotiated the river’s obstacles. Peterboroughs are classic, finely crafted wood canoes, once made by the Peterborough Canoe Co. in Peterborough, Ontario, before it went out of business in the 1960s. The company began operations in 1892, but before it closed, it would become an icon with north woods canoe travelers. McDaniel’s canoe was one of nearly a dozen vintage canoes on the water this day. He had come out for the fall gathering of the Michigan chapter of the Wooden Canoe Heritage Association, a national organization dedicated to the preservation, restoration and use of wood or bark canoes. To see them on the water, it is no wonder. Each canoe this day had character in spades. Some were finished for show; others were works in progress. Fifty canoes is nothing by modern manufacturing standards, but canoes today are largely the product of mass manufacturing, made of synthetic materials or aluminum. Even wood trim and cane seats, while still available, have been replaced by modern materials. aesthetics inherent in wood canoes with their natural look and quiet, steady ride. Kelly was paddling his 1915 Kingsbury, built in the Charles River area near Boston, Mass. It is one in his collection of more than a dozen antique canoes. Kelly flew pennants from each end as paddled downstream sitting on a cushion against a varnished wood-fan backrest. “It usually starts as a need for information,” he said. “Who made my canoe, or what is it worth or how do you fix it? Then, it quickly evolves into friendship with others that share an interest in the history, qualities and craftsmanship of these canoes,” Kelly explained about the appeal of the 1,800-member WCHA. That camaraderie was evident at Ma Deeters, a restaurant in nearby Luzerne the night before. WCHA member’s stories floated across the tables and filtered through the tavern’s background chatter during its famous Friday night fish fry. All of that drew Bill and Janette Hart, of Frankenmuth, to WCHA. The couple floated this day in a Baker canoe made in Michigan. It is one of two they own, along with a 1905 Morris they both are excited to restore. B.N. 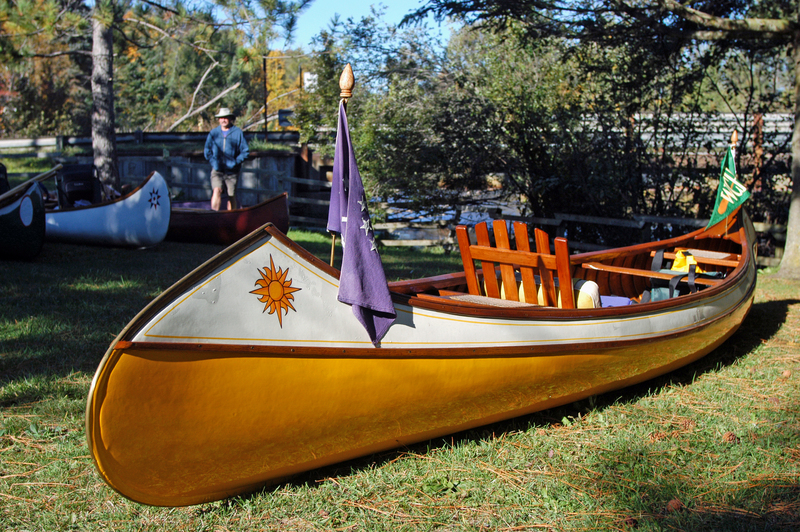 Morris was another of the Maine-based wood canvas canoe pioneers. He built canoes from the 1880s until 1920, when a fire destroyed his factory. His wooden canoes are considered among the finest built. For more information about antique and classic wood or bark canoes, check out wcha.org. 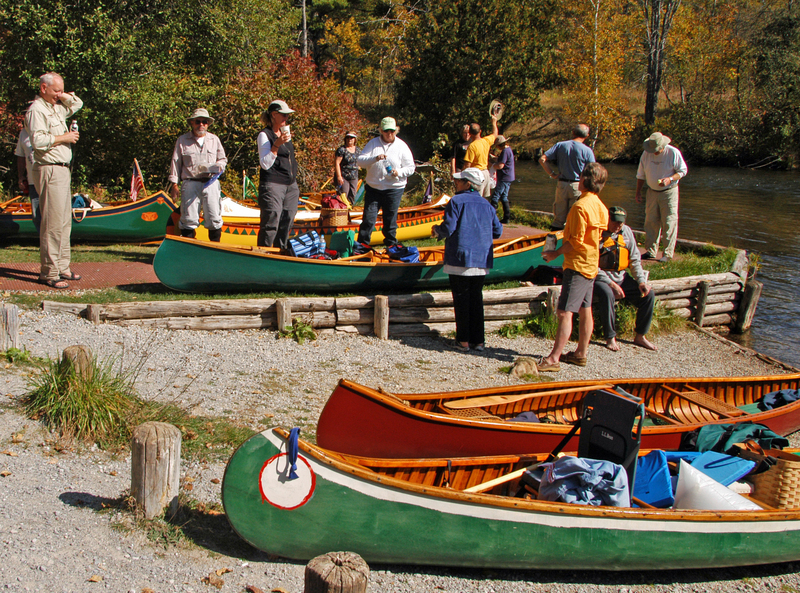 This entry was posted in Uncategorized and tagged Artisans, AuSable River, Canoe, Canoeing, Gerrish, Morris, Old Town, Paddling, Peterborough, vintage canoes, Woodcraft, Wooden Canoe Heritage Association, Wooden Canoes. Bookmark the permalink.